Trusted experts for all your plumbing and septic needs. 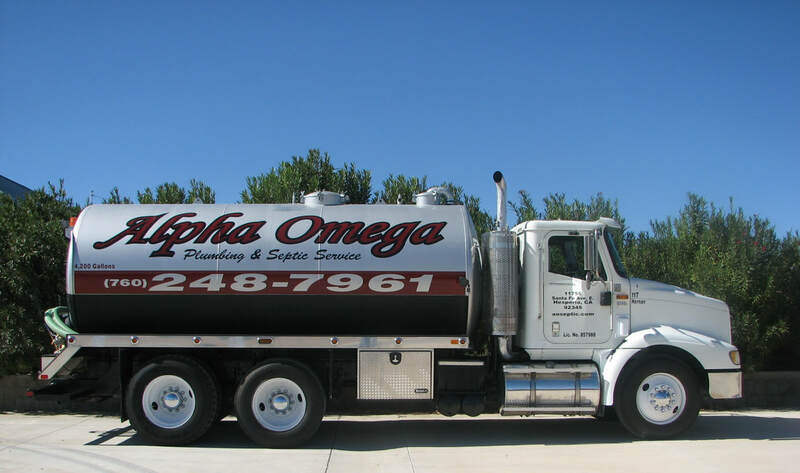 Since 1984, Alpha Omega has offered septic services to the entire High Desert area. As experts of your septic system, we can handle all jobs; from any plumbing needs, to the maintenance of your septic tank or grease trap, to the installation or repair of your complete septic system, including septic tank, leach line, or seepage pit. Alpha Omega employees always maintain a professional image. We are courteous, knowledgeable, and helpful. Our drivers wear uniforms and our trucks are clean and well maintained. We practice environmentally safe work habits, and by maintaining your septic system you can help us keep the environment clean. ​We are extremely knowledgeable in the septic industry and encourage you to call upon us for all your septic and plumbing needs.